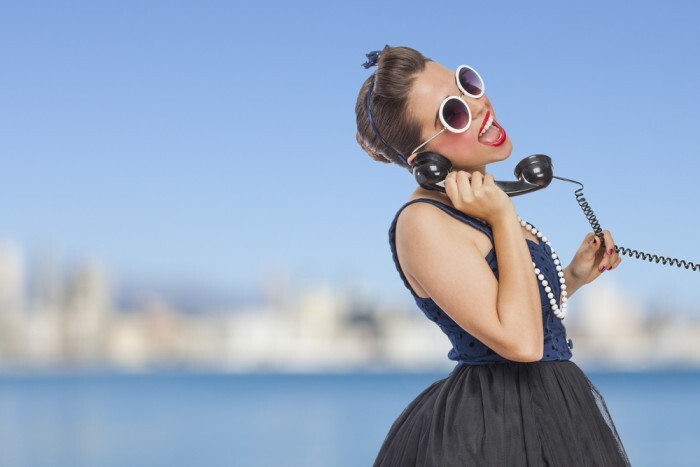 More than 90 percent of organizations now recruit with social media. I’ve looked at the most recent data to find the most popular and effective recruiting content on Facebook, Twitter, and YouTube. Here’s how top brands are engaging job-seekers on social platforms and how you can do the same. H-E-B also tagged a number of the interns in each photo. This call to action challenged the most active social users — Millennials — to interact with and share the content in a friendly competition. So not only was this a great post that highlights an often-forgotten segment of the workforce, it also encouraged interactions that make content go viral. The result is amazing. The post itself got 199 likes, 45 shares, and 10 comments — including one from H-E-B itself encouraging the commenters to share. Each photo also generated huge interactions. The photo from the “Border” region, for example, received 416 likes, two shares, and five comments. The post thus appeared in many people’s Facebook newsfeeds. Interns felt valued. 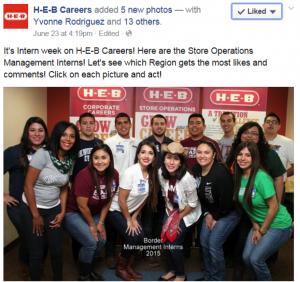 And H-E-B showed that it loves its workforce and knows how to use social media — remember, this was all on the H-E-B Careers Facebook page, not its consumer-facing page. How you can be like H-E-B: Make your employees stars! Facebook’s main purpose is for users to show off, so people will often share content that celebrates them, even from their employer. Don’t wait for a company event to take photos (and videos!) of your workers; get candid shots of them having fun at any time of year. H-E-B’s other smart tactic was to make the post competitive, an idea you can easily borrow for any content like multiple photos. H-E-B also monitored the comments and jumped in when workers weren’t quite getting it “right,” a good reminder to keep an eye on your Facebook posts so you can respond to questions, suggestions, and complaints. This basic tweet was retweeted 31 times and favorited another 13. Many of the retweets were from employees who became brand ambassadors by sharing their employer’s content. 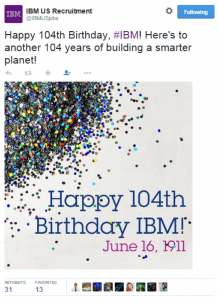 The use of the hashtag #IBM meant the tweet would be found in searches for the company on its birthday, adding it to the Twitter conversation. The tweet itself packed fun, employer branding (“building a smarter planet”), company info (We’re a legacy brand, unlike, say, Google), and a cool image into just 140 characters. 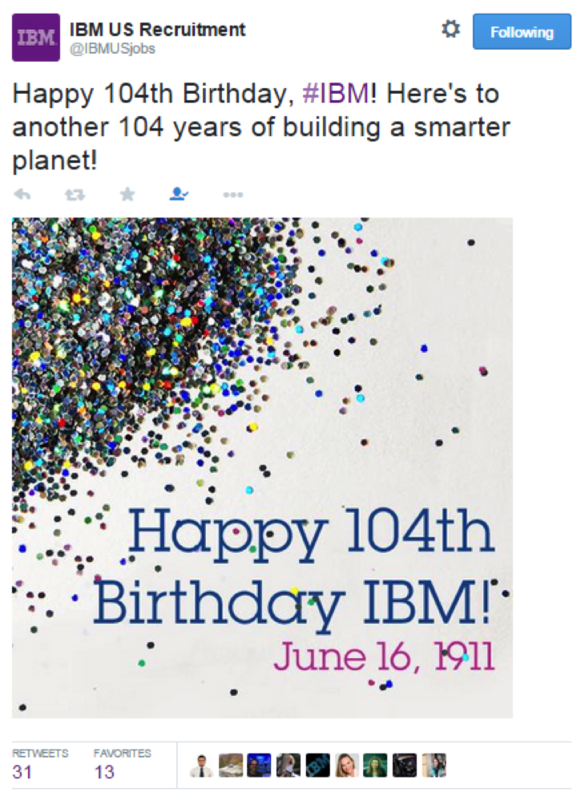 How you can be like IBM: Celebrate your company! Milestones, conferences, employee events, and peer awards provide great recruiting content to post on social media. They provide a break from your regular posts and offer differentiators that are relevant to your talent pool. Google’s birthday post, for example, could argue that its youth is an advantage over IBM’s century of existence, just as IBM implied the opposite. National holidays provide a similar opportunity: if your organization is particularly green, you could highlight Earth Day, while if diversity is one of your strengths, you could post special content during Black History Month or LGBT Pride Month. Whichever strategy you choose, milestones, and events provide variety to your social recruiting calendar. Fidelity Jobs’ YouTube channel saw almost a 9 percent increase in views this week, led by its brief but compelling video “Women in Financial Services.” The piece, which runs just under two minutes, features women of different ages and from different divisions talking about the company’s opportunities for women and its commitment to work-life balance. One branch service manager says that women are natural nurturers, helping them form close relationships with clients. The women are in their office and speak to an off-camera interviewer. There are brief graphics for their names and titles, and music playing underneath. The video presumably cost almost nothing, but its impact as a differentiator, as a form of outreach, and as an indicator of diversity, is huge. How you can be like Fidelity: Videos are increasingly easy to shoot, edit, and distribute. Add to that statistics like the one found by Forbes, that 59 percent of senior executives would rather watch a video than read text. Video is an important part of a social recruiting strategy, so what should you produce? You can make a video similar to Fidelity, with a segment of your workforce (women, veterans, seniors) talking about the opportunities you offer. You could could interview recent hires or interns and convey their enthusiasm to job-seekers. You could also show off your office space, your neighborhood, and even your city like we did with Williams, Williams & McKissick. As Fidelity shows, a good, interesting, brief video doesn’t cost much. Until next month, Happy Birthday America.